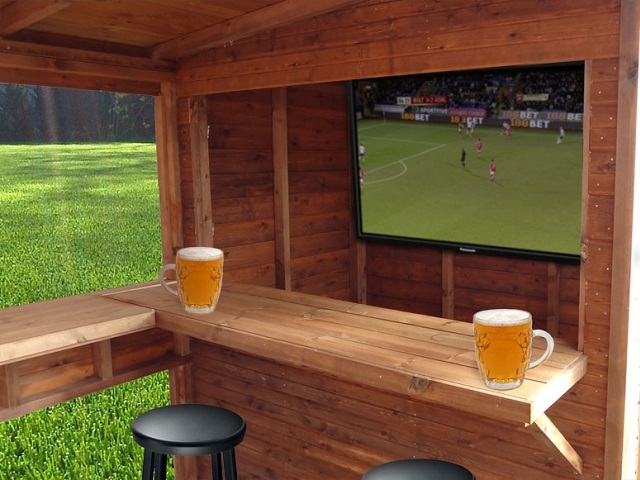 In the last couple of years, we have witnessed the emergence of bar sheds, which are now threatening to replace all previous versions of man caves. If you plan to build a place for you and your friends to gather and spend some quality male time alone, these structures are definitely something you should take into strong consideration. Here is the story behind them and their major characteristics. It all started in the UK’s Community Gardens where anyone who showed interest got a chance to grow fresh fruits and vegetables. The sheds used to store tools were the most convenient place to have a drink or two after gardening .This led into gatherings of neighboring gardeners and shed bars were born. Things started to heat up in 2007, right upon smoking was banned from interior spaces and it slowly began to spread outside Gardens and UK for that matter. Since wood is the preferred choice of material since it fits the purpose and the surroundings most naturally you practically have endless opportunities when it comes to design, both interior and exterior. If you lack inspiration on which design to choose, there are various specialized magazines and online locations where satisfied owners share their experiences and pictures of their bar sheds, all well worth considering. Backyard would be the best location for a bar shed, as detached from yours and your neighbors’ houses in order to preserve everyone’s privacy. If you already happen to have a garden shed, rearranging it into a bar shed can easily be performed. On the other hand, when it comes to building a bar shed, DIY project is worth considering if you are at least semi experienced and have all the necessary tools. Otherwise, consider opting for one of many pre made sheds available. What good is a bar shed if there is no music coming from it or fans cheering for their favorite team? Considering the day and age we live in network media streamers would be the best solution for both types of entertainment. All you need more is a stereo system and an LCD TV hanged on the wall and with a touch of a button you can switch from watching a derby match to listening to your favorite band. Take this opportunity and decorate the walls in your favorite art. Bar related decorations such as old advertisements, watches and bar signs always fit perfectly. However, there is always a spot for your favorite works of art, interesting photos and inspirational messages. After all, this is your private space and there are no strict design rules here, anything that enriches the place and keeps the spirits up deserves a chance. As you can see, opting for a bar shed promises a lot of fun, not to mention the freedom and those positive friendly gatherings we all seem to lack these days.